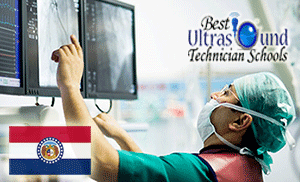 The state of Missouri has a grand total of six institutions that offer accredited sonography tech programs. One of them is a hospital--St. Luke's Hospital of Kansas City, to be exact. Four of them are institutions established to provide tertiary education or vocational training to their respective communities; they are the University of Missouri-Columbia (Mizzou), Hillyard Technical Center in St. Joseph, St. Louis Community College, and Cox College in Springfield. The sixth institution is Sanford-Brown, a national educational organization that has a campus in Fenton. All ultrasound programs in Missouri are accredited by the Commission of Accreditation of Allied Health Education Programs (CAAHEP). Three of the sonography programs in Missouri--specifically offered by Hillyard, St. Louis Community College, and St. Luke's College--award a Certificate in Diagnostic Medical Sonography upon completion. The certificate program has a curriculum that is easy to complete in little over a year. (St. Louis' offering in particular consists of 42 credits.) Mizzou, which is the largest university in Missouri, has the most elaborate ultrasound technician training in the state. Here students can get a Bachelor or Master of Health Science (BHS or MHS) in Diagnostic Medical Ultrasound. Cox College, a private institution narrowly focused on the health sciences, also offers a Bachelor of Science in diagnostic medical imaging. Sanford-Brown is the only institution of the six that has a two-year Associate of Applied Science program in ultrasound technician training. Ultrasound technologists in Missouri generally make a little more money annually than professionals in the same field on a national scale. In 2012, the U.S. Bureau of Labor Statistics reported that diagnostic medical sonographers in the state had a median yearly income of $66,600 ($32.04 per hour). This is slightly more than the national median of $65,900 ($31.66 per hour). The bottom 10 percent of sonographers in Missouri made $48,100 ($23.12 per hour) in 2012, compared with the top 10 percent, which made $86,400 ($41.52 per hour). According to the BLS, there were 910 diagnostic medical sonographers in Missouri in the year 2010. The agency expects that number to grow to 1,210 (a 33 percent growth rate) between 2010 and 2020. Webster University 470 E Lockwood Ave.